While I’m a huge fan of pumpkin beers, I must disclose that I’m an Imperial Pumpkin newbie. This is one of just a few I have tried and, if it is any indication, I just may turn out to be a fan of the style. Hoppin’ Frog Brewery makes a few good brews that have hit my radar, so it’s not a surprise that I ended up liking this one. I did share it though to avoid consuming an entire 22-ounce bottle of big-alcohol beer. The first thing I noticed when I poured this beer is that it is one of the most crystal-clear beers I have seen in a glass. I betchya it’s filtered. It’s also very orange. 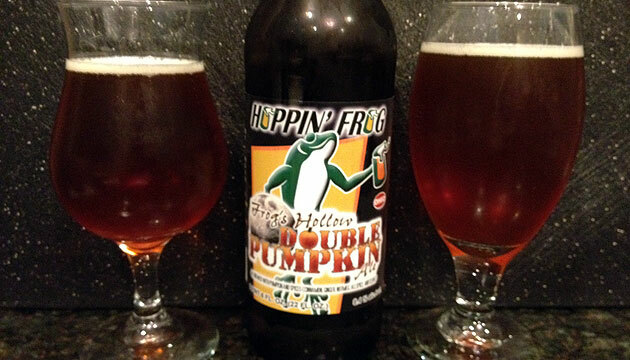 I don’t know if that is completely on purpose, but if not, it is certainly a happy coincidence for a pumpkin beer. As for the flavor, it starts with a strong presence of the usual pumpkin beer spices – cinnamon, nutmeg and clove all introduce themselves assertively if not just a touch abruptly. Not to worry, though, as the spices soon give way to a very malty and somewhat sweet character. There is very little bitterness at the end, and virtually no hop presence. This is a great dessert beer on its own and could also accompany other desserts well; I’m thinking roasted marshmallows or something of the like. It’s the season for these beers, so you can expect some upcoming pumpkin-related ramblings from me. (By the way, I’m open to suggestions, via email or a comment on the blog.) In the meantime, I encourage you to check out the squash-inspired selection at your local beer store. These seasonals seem to be growing in popularity, so if you see one on the shelf, you should probably put one in your cart. Cheers!